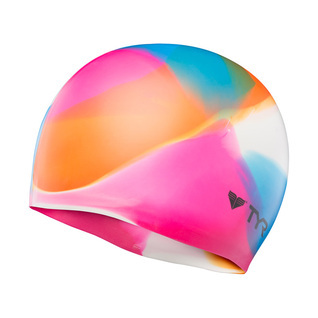 The Tyr Kaleidoscope Silicone Swim Cap is a durable, hypoallergenic, long lasting cap. Made to slide on easily and stay on. Suitable for both adults and youths. Ideal for casual or competitive use. Our swim cap features durable and long lasting color and a unique design. I love the color of my first swim cap. Now I know why the better swimmers use one. What a great first experience! I have a small head and it still fits me snugly. I bought it to wear in my hot tub when I don't want my hair to get wet. It does the job. I won't miss my daughter in this cap! I haven't worn the cap to swim yet. I put it on at practice but realized it was going to be too hot. I live in FL and swim outside year round. This will be a great cap in the 60 degree and below days in the winter.